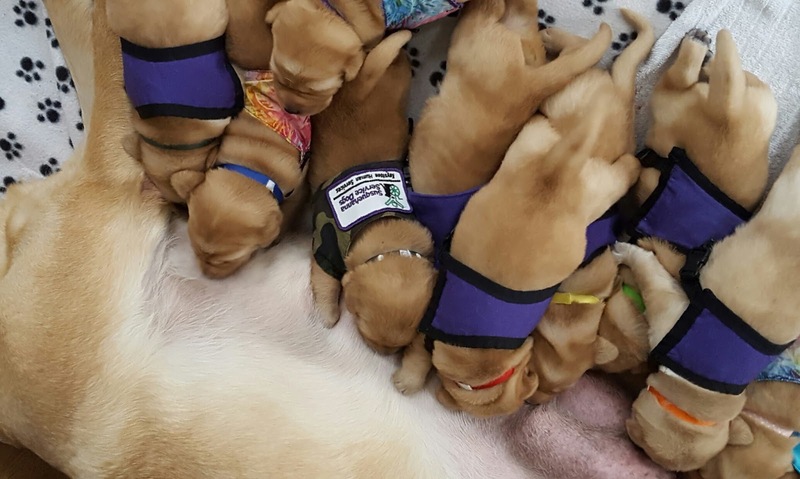 The Love Bug puppies are two weeks old today, and they’re wearing their tiny service dog in training harnesses! Why are these puppies already wearing harnesses when they’re too young to go out in public? We start teaching all of our pups to wear the harness when they’re just a few weeks old to help prevent them from developing harness sensitivity. When they’re older, they’ll wear a harness every time they go out in public with their raisers and later their partners. We want our dogs to be completely comfortable wearing it while they work. When working service dogs wear a service dog harness, it also reduces the likelihood that a business will challenge the person’s right to be there with their service dog, making it easier for our partners to go about their lives. The ADA gives people public access with their service dogs, which means they and their service dog can go any place that’s open to the public. This includes restaurants, grocery stores, movie theaters, and more. We want our service dogs to make people’s lives easier, not more challenging. So all of our dogs, like the Love Bugs, start wearing harnesses when they’re still tiny puppies. It’s one small step in their service dog training. And as you can see in the photo above, the puppies are already getting very comfortable in their harnesses! 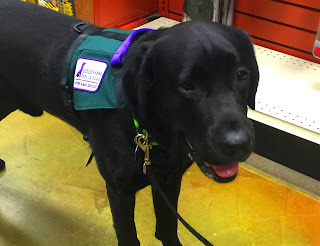 If you’d like to learn more about the service dog law, you can read the service dog section of the ADA, as well as these FAQs aboutservice dogs and the ADA. You proved yet again that you are a phenomenal asset to Cumberland County Children & Youth. As I sat in the playroom yesterday with my young friend, she became very nervous when her caseworker entered with a new caseworker and introduced her. My young friend looked at me to help her feel better, and I did the best I could with my words. But only a few minutes later, your handler helped you knock on the door, and before my friend even saw you, she heard the shake of your collar. Her worries left her and with a huge smile on her face, she yelled, “Diego!” just as you stepped in the doorway. She remembered everything you had taught her five months ago, and she asked for your paw and a fist bump. You obliged several times, and her smile grew. After a couple of visits, you even let her lay her head on you while the two of you snuggled on the floor. Then came some vigorous ball playing. I had to leave to go to the hearing, but my friend was so focused on you, she never knew I’d left. When I came back, your card was clutched in her hand. As we met up with her little sister in the parking garage, she leaned over and told her all about you and that she already had a card and had asked for that one for her. So, that was the second smile of the day you created. You are such a sweet, loving boy, and I know this is just one moment of many each and every day. I’m so glad you picked Cumberland County to be your home. Keep up the great work and keep on wagging! P.S. 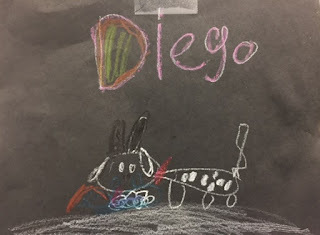 My friend drew this picture for you. If you would like to support future service dogs, please join Susquehanna Service Dogs for the Highmark Walk for a Healthy Community on May 20 at HACC in Harrisburg, PA. SSD is one of 48 nonprofit organizations participating in the walk. All of the money raised by our walkers comes directly to us. 1. Sign up for the Highmark Walk, raise money, and walk on May 20. 2. Be a virtual walker.